There's more than one way to skin a webinar -- depending on how you like to get content. In the case of our recent webinar with Microsoft, we've shared the slides and audio so far. And today, we bring you the complete archive. For those of you who missed it, the webinar covered how life sciences professionals can use ProtoSphere and Lync together for virtual collaboration. Les Jordan, Chief Technology Strategist for Microsoft Life Sciences, brought us up to date on what Microsoft has been doing in the life sciences arena lately. And I presented some of the major ways life sciences professionals can improve collaboration and productivity by combining Lync and our ProtoSphere virtual immersive environment. We also have the webinar transcript in the works, and will be sharing that with you on the blog soon. Last week we shared with you the slide deck from our webinar with Microsoft about how life sciences companies can use ProtoSphere and Lync together for virtual collaboration. Today we have the complete audio from our webinar for you. You can stream it from your computer, or feel free to download it, save it, and pop it on your iPod to listen to on the road or in your car. 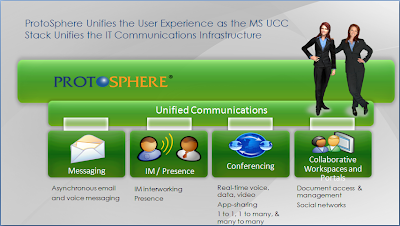 TMCnet's Tom Keating says ProtoSphere is "definitely worth checking out"
I met Tom Keating when I was in New York City in November for Microsoft's Lync launch event. Tom has been at the front lines of the Internet telephony/VoIP industry since the mid-90s. Today he's the CTO of Technology Marketing Corporation (TMC) and blogs at the company's TMCnet.com. In New York, Tom and I got to talking about how ProtoSphere integrates with Lync. I told him about the audio experience, and how Lync improves the way you can collaborate in ProtoSphere. We got down to some technical details on ProtoSphere's data visualization capabilities and how you can leverage Lync's desktop sharing capabilities in ProtoSphere's 3-D space. Tom posted our conversation in a Q&A on TMCnet yesterday. He also included his personal take on ProtoSphere's Lync integration. 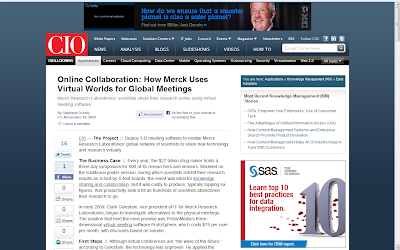 He writes, "Gartner named ProtonMedia Cool Vendor for 2010 for Collaboration. I second that award! Very cool technology definitely worth checking out." Click over to his post and find out why. Nice meeting you Tom, and thanks for the review! Our webinar with Microsoft's Les Jordan went great on Tuesday. We had some good discussion on ways life sciences professionals can use Microsoft Lync and ProtoSphere together for virtual collaboration. But even though the webinar is over, we have a host of resources we're planning to share coming out of it. So no worries in case you missed it! First up is our slide deck. It contains a break down of some of the major ways life sciences professionals can improve collaboration and productivity by combining Lync and our ProtoSphere virtual immersive environment. It also gives the main benefits that ProtoSphere is providing our life sciences customers, including key metrics from our work with Merck. You can view it below. Also feel free to download it and share with your colleagues. Check back soon for more from this webinar, including the archive, transcript, and other resources. Last month we introduced ProtoSphere Lync Edition 2010, our latest version of ProtoSphere which works with Microsoft Lync Server 2010. The beta version of ProtoSphere Lync Edition is now available for you to try for free. You'll be able to test all of our new functionality first hand, including our crystal-clear VoIP, outbound calling to any number, always-on VoIP, echo cancellation, and more. Our beta also includes our new standard suite of zones and a set of special demo zones geared specifically for life sciences professionals. As always, we welcome your feedback and ideas! 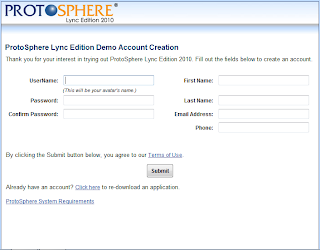 So download ProtoSphere Lync Edition beta, play around, and let us know what you think! Hey folks, just a friendly reminder to make sure you're at your computer at 2 p.m. EST today for our joint webinar with Les Jordan, Chief Technology Strategist for Microsoft Life Sciences. It will be a valuable learning experience for anyone involved in life sciences sales, marketing, technology, training, and compliance. Attendees will be among the first life sciences professionals to see how these technologies work together in our new ProtoSphere release, ProtoSphere Lync Edition 2010, and discover how they can use it in their organization. If you haven't registered for our webinar yet, there's still time to sign up. For more details on the webinar, turn to our previous post about it. See you soon! Sure we're advocates of virtual meetings. But we're not foolish enough to think a day will come -- soon or ever -- when face-to-face meetings go away. That's just not going to happen. And the reasons are simple. They are absolutely the best way to build relationships and a sense of community, create and mold a culture, foster team spirit, motivate and recognize workers, and drive that overall deep connection at the core of our being. We work our best when we're connected, in sync, and supporting one another's efforts. But those face-to-face work sessions we rely upon are coming at significantly increasing costs. Therein lies the challenge statement. How do we remain connected, leverage those relationships, grow productivity (individual and collective), increase collaboration, and sustain the overall interactive goodness in a cost-conscious environment? These opposing forces -- cost reductions and increasing collaboration -- place a premium on sustainability, a best practice designed to reinforce, protect, preserve, and expand upon the value gained by every in-person meeting. Having face-to-face meetings without a sustainability plan is wasteful, leading to fleeting knowledge, transient understanding, countless repetition and do-overs, vanishing returns, and lost value. And that's where a virtual collaboration platform comes to the fore. Highly interactive virtual meetings are an effective means of mastering initiatives launched in face-to-face meetings, such as new materials, approaches, and skills. They allow each participant to maintain and even expand the sense of connection, camaraderie, comprehension, interaction, and contribution, while delivering sustainability. How? Virtual meetings enable us to communicate and collaborate in ways that enhance what we do in person. 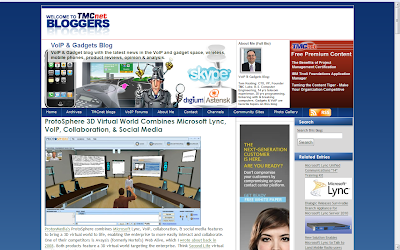 Take two examples of typical meetings held in a virtual immersive environment. 1) In advance of a face-to-face meeting, virtual meeting(s) effectively build anticipation, interest, preparation, and excitement. 2) After a face-to-face meeting, forming virtual team and special-purposed subject matter rooms, coupled with 24/7 persistence of content, provides a place to reinforce, practice, and continue skills development, as well as openly discuss and share ideas. Given today's constant pressures to reduce costs, more face-to-face meetings are just not a valid option. Reducing the number and/or duration of face-to-face meetings creates risk to overall effectiveness, and is an equally invalid option. The truth is, in-person and virtual meetings both have their own merits and advantages. Perhaps that's why so many companies are integrating virtual meetings with their in-person meetings. Some tasks are better accomplished in person. Others are more effectively sustained and achieved virtually. Merging both in a cohesive strategy can bring synergistic value. Each type of meeting can increase the effectiveness of the other. 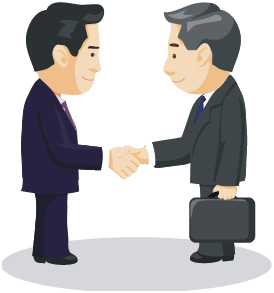 Face-to-face meetings are more effective when the pre and post activities surrounding it directly support and sustain the messages and materials discussed. Virtual meetings benefit from the relationships and initial sense of connection built during face-to-face encounters. A virtual environment's 24/7 accessibility and persistence of content bring a level of convenience and ease to planned and serendipitous meetings that, even with unlimited funding and travel privileges, cannot be achieved with in-person meetings. In today's competitive and cost-sensitive world, moving forward with a single meeting methodology limits the value and advantages that can be achieved compared to a well-thought-out strategy combining and leveraging both face-to-face and virtual sessions. Over the weekend I was talking to Dr. Karl Kapp about how ProtoSphere now works with Microsoft Lync Server 2010. He put finger to keyboard today and posted his reaction on his blog. Karl takes a three-pronged look at the impact of ProtoSphere's Lync integration, including from a functionality, enterprise, and industry perspective. Flip over to his blog to see how ProtoSphere Lync Edition 2010 fairs in Karl's eyes. As always, thanks for the analysis and insights, Karl! Merck's use of ProtoSphere to hold a virtual poster session continues to gain media attention. Merck scientists recently shared their research about using ProtoSphere with writer Stephanie Overby, who reported the findings in CIO magazine. You can read her article now online, or, for those who still like to hold cold hard copy in their hands :), in the latest issue of CIO magazine. Stephanie shares Merck's thoughts and analysis on why the company wanted to hold a virtual poster session, why it decided to use ProtoSphere, and how it built the environment and ran the event. She also included what Merck learned from the deployment, and its advice for making virtual poster sessions work. "After the event, 83 percent of users said access to the virtual posters’ information was the same as or better than in the physical world. More than half said the virtual symposium overall was more valuable than the in-person version ..." reports Stephanie. Many other interesting results and takeaways can be found in the CIO article. Thanks to Stephanie and the Merck team for sharing the findings!